Varanasi is known for nature, historic sites, shopping, spas, and museums. Your plan includes some of its best attractions: contemplate the waterfront views at Ganges River, soothe aching muscles at some of the top local wellness centers, contemplate in the serene atmosphere at Sarnath, and appreciate the history behind Dhamek Stupa. 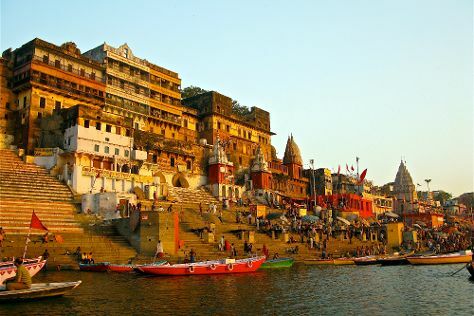 For traveler tips, reviews, ratings, and more tourist information, use the Varanasi visit planner. Dhanbad to Varanasi is an approximately 10-hour car ride. You can also fly. December in Varanasi sees daily highs of 26°C and lows of 13°C at night. Cap off your sightseeing on the 29th (Sat) early enough to travel to Allahabad. Rising from the meeting point of three of India's holiest rivers, Allahabad has a long and colorful history. Start off your visit on the 29th (Sat): take in the views from New Yamuna Bridge, take in nature's colorful creations at Company Gardens Allahabad, contemplate in the serene atmosphere at Hanuman Mandir, then make a trip to Triveni Sangam Allahabad, and finally contemplate the long history of Allahabad Fort. To see ratings, where to stay, photos, and other tourist information, refer to the Allahabad trip itinerary website . Use the Route module to find suitable travel options from Varanasi to Allahabad. Expect a daytime high around 30°C in December, and nighttime lows around 12°C. Finish your sightseeing early on the 29th (Sat) to allow enough time to travel to Lucknow. Start off your visit on the 30th (Sun): meet the residents at Nawab Wajid Ali Shah Zoological Garden, then steep yourself in history at Rumi Darwaza, then see the interesting displays at The Residency, and finally shop like a local with Hazratganj. Get ready for a full day of sightseeing on the 31st (Mon): admire the striking features of Bara Imambara, make a trip to Chowk, then stroll through Dr. Ambedkar Park, and finally admire all the interesting features of La Martiniere College. To see other places to visit, ratings, more things to do, and more tourist information, use the Lucknow trip planner . Explore your travel options from Allahabad to Lucknow with the Route module. Plan for a bit cooler temperatures traveling from Allahabad in December, with highs in Lucknow at 26°C and lows at 9°C. Wrap up your sightseeing on the 31st (Mon) early enough to travel back home.